Previously we discussed basics around MicroPython and also configured to run MicroPython via IDE. Here is ESP32 MicroPython Setup with Adafruit Ampy for Windows, MacOS X and Linux. You need Python needs to be running and install few tools. An important note for this guide is to use the default command line tool for installation of Python packages such as Command Prompt for Microsoft Windows (do not use Ubuntu Bash on Windows 10 for this guide). Command Prompt will accept almost same format commands like that of *nix system. On Windows system, it is not easy to access the COM ports via Ubuntu Bash as /dev/ttyS. Command Prompt supports many *nix tools such as GNU Nano, grep etc. Essentially you’ll not feel huge problem with Windows Command Prompt. Use the default Terminal app for MacOS X. Mac may need to append sudo before pip commands. GNU Linux are most flexible and no special instruction required. Attach your ESP32 with the computer. Open device manager or Arduino IDE to note the port. As for Windows, it will be some COM, like COM6. In *nix convention, serial devices will be at /dev/ttyS like /dev/ttyS6. I guess this guide ended here ! This Article Has Been Shared 2653 Times! Base64 images are easy to transmit over the network. Here is How to Use Base64 Encoding on ESP32 Arduino. ESP32 lacks sufficient RAM. IBM Watson Visual Recognition of Images Supports cURL. ESP32 Arduino Can Send cURL of Images and Receive JSON Response on Serial Monitor. Such need is common when then need interfacing for IoT with household gadgets. Here is How to Invert Signal for Arduino (HIGH to LOW or the Reverse). No surface is perfectly smooth and inelastic. When two surfaces of pushbutton comes together with any force, there is kinetic energy that makes ringing. 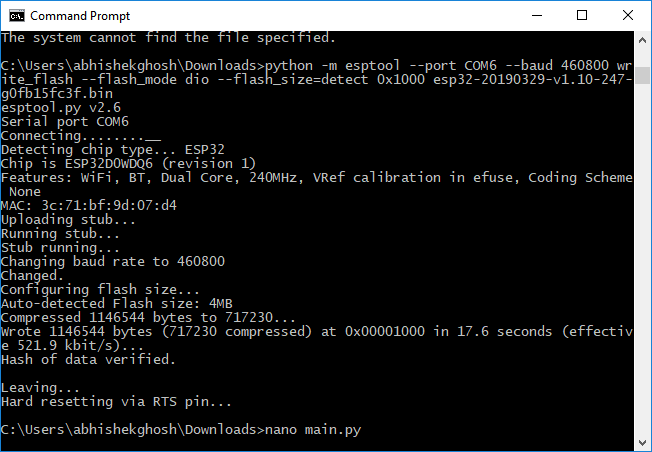 Cite this article as: Abhishek Ghosh, "ESP32 MicroPython Setup with Adafruit Ampy," in The Customize Windows, March 30, 2019, April 18, 2019, https://thecustomizewindows.com/2019/03/esp32-micropython-setup-with-adafruit-ampy/.